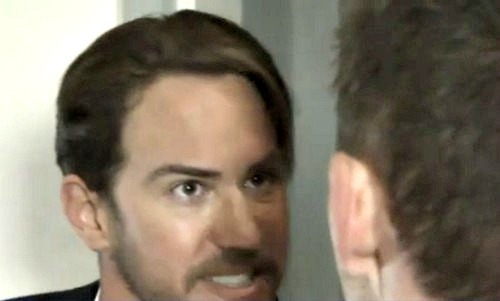 General Hospital (GH) spoilers tease that Peter’s (Wes Ramsey) charade is slowly unraveling. He’ll soon feel the walls closing in, so he’ll have to think fast. Peter has been doing everything in his power to keep his Port Charles life intact. He cares about Maxie (Kirsten Storms) and her baby, so he’s repeatedly shut down the idea of leaving town. Peter may regret that decision in the near future. He’ll at least regret leaving Faison’s (Anders Hove) lighter around for Sam (Kelly Monaco) to find! General Hospital spoilers say Jason (Steve Burton) finally has the link he needs. He’ll plot Heinrik’s exposure and hope to make his captor pay. Maxie will definitely learn the truth, so Peter’s brewing love story will be blown. However, he may have much bigger problems. Jason would undoubtedly get satisfaction out of killing Peter. Valentin (James Patrick Stuart) probably wouldn’t mind eliminating his problem either. Even if Peter can avoid death, there’s always the threat of prison. If Jason can score enough evidence and contain his deadly rage, Peter could find himself behind bars. He’ll definitely have that on his mind when he realizes he’s been caught. Nevertheless, Peter’s learned how to improvise over the years. He can roll with the punches, so he’ll try to regain control of this situation. GH spoilers say Peter will realize he’s sitting on some leverage. He’ll come up with a new plan that could leave him a free man. There’s a good chance this involves the flash drive from the disco ball ornament. 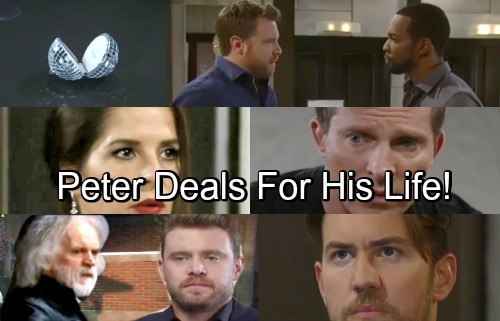 Peter has Drew’s (Billy Miller) memories, so he may make a deal for them. He could agree to give Drew his life back in exchange for his own. For Sam’s (Kelly Monaco) sake, Jason might go along with that agreement. After all, it would work out better for Jason if Drew recalled his past. Drew could focus on other former flames instead of Sam and maybe forget about her altogether. General Hospital spoilers state that Drew’s memory procedure will move forward down the road, so stay tuned. Will Peter use the flash drive to save himself? Will Jason sacrifice justice out of love for Sam? We’ll give you updates as other GH news comes in. Stick with the ABC soap and don’t forget to check CDL often for the latest General Hospital spoilers, updates and news.